As many New Yorkers are training to run their next marathon, preventing injuries is key. However, even with proper training, injuries can develop and it is crucial to seek effective treatment immediately in order to correct the damage and prevent further injury, which can impair the runner’s ability to perform. Frequent running can heighten the risk of developing entrapped nerves in the knee joint, causing severe discomfort, pain, and inability to walk or run. The saphenous nerve, the largest sensory nerve in the body, is commonly affected by entrapment due to high impact activity, specifically running. Entrapment of the saphenous nerve can occur anywhere between the hip and knee joint, in one or both legs. In addition to entrapment, the saphenous nerve can also suffer from tension and inflammation, which are also painful and debilitating. Chiropractic treatment and physical therapy are some of the safest and most effective treatment options for marathon runner’s knee pain. Because these non-invasive, non-surgical therapies do not carry any negative side effects and require no downtime and offer the possibility of active recovery, they are highly recommended for patients looking to maintain a certain level of activity while they heal. Dr. Shoshany and his team offer the latest in diagnostics and non-surgical treatments in NYC to identify and treat marathon running injuries. Each patient is personally diagnosed through X-Ray analysis and/or ultrasound analysis (for those unable to undergo X-Rays) in addition to a biomechanical analysis to develop the best individual treatment plan to fit the patients fitness and lifestyle needs. Dr. Shoshany offers his NYC patients a varied range of highly effective, non-surgical treatments to correct and prevent marathon running injuries. Some of the most sought-after treatments, which can be applied on their own or combined as part of a comprehensive treatment protocol include chiropractic adjustments, soft-tissue mobilization (Active Release Techniques® and Graston Technique®) to remove adhesions, cold laser therapy to painlessly decrease swelling and discomfort through cellular regeneration, physical therapy to regain motion and strength, medical massage therapy to treat stressed soft tissue, acupuncture to reduce pain, and more. Patients who are marathon runners show great improvement and a positive response to non-surgical physical rehabilitation treatments, with the advantage of allowing for a faster, more active recovery than would be possible with more invasive therapies. For additional information about Dr. Shoshany’s available treatments for marathon running injuries in NYC or to schedule a consultation, please visit www.drshoshany.com or contact 212-645-8151. When a patient experiences pain in the neck area, it is often caused by a pinched nerve. The term “pinched nerve” refers to a nerve that is entrapped or under excessive pressure because of herniated or bulging discs anywhere along the spine, including the neck. Other causes of pinched nerve in the neck can include degenerative disc disease, subluxations, and facet syndrome. When nerves are under stress, they become irritated and send painful signals to alert of a problem that needs to be corrected. Aside from discomfort and pain, a pinched nerve in the neck can also cause loss of motion and sensation, as well as weakness and inability to properly function. This can extend from the neck to the shoulders and arms, because the nerves that originate in the neck prolong down the upper extremities. Problems with hand function (similar to carpal tunnel syndrome) and headaches are also possible symptoms of a pinched nerve in the neck. Chiropractic care is one of the most effective treatments to correct spinal issues that cause a pinched nerve in the neck. Because it is a safe, non-invasive, non-surgical therapy, patients experience progressive pain relief and overall wellness without any additional downtime. An expert chiropractor will diagnose the patient by evaluating the results of diagnostic tests such as X-rays, MRIs or nerve tests – one test or a combination of tests is prescribed depending on the patient’s condition and needs. At Dr. Steven Shoshany’s state-of-the-art physical rehabilitation facility in NYC, X-rays and nerve tests are performed and reviewed in-house for the patient’s convenience. Following a diagnosis that reveals the patient has a pinched nerve in the neck, a personalized treatment plan will be developed. Dr. Shoshany’s top treatments for pinched nerve in the neck include chiropractic adjustments and cervical spinal decompression. These options are safe and highly effective because they address the root cause of pain in order to provide long-lasting relief and wellness. For additional information on Dr. Shoshany’s chiropractic and spinal decompression treatments for pinched nerve in the neck in NYC, please visit www.drshoshany.com, where you can also schedule a consultation and review the wide range of non-surgical treatments available for pain, sports injuries, and chronic conditions. One of the most common conditions that we see in our office is that of patients dealing with pain due to a cervical herniated disc. The image above is a cross-section of a disc and spinal cord and nerve root. 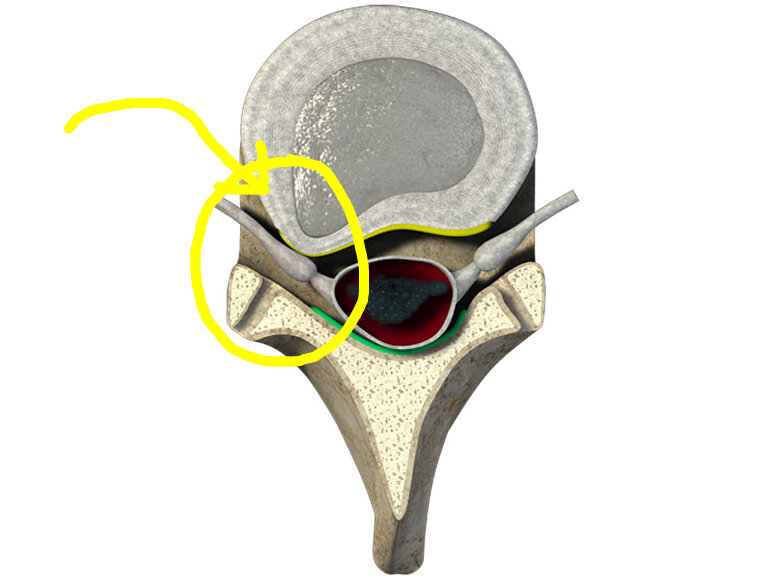 The center of the spinal disc is called the nucleus and the outer layers are called the annulus fibrosus. I circled the disc bulging that is putting pressure on the left spinal nerve root. If this disc is putting pressure on the fifth cervical nerve root the patient would feel pain,numbness, burning in and around the upper arm area. Cervical Radiculopathy is a medical terminology used to describe Nerve damage caused by severe pressure to the cervical nerve roots. Common cause include disc bulging or disc herniation, degenerative disc disease, spinal stenosis osteoarthritis, and facet syndrome. Symptoms can include pain, numbness, tingling, and or muscle weakness in the regions of the shoulders, arms, hands or fingers. Very often unless a patient has had a cervical MRI patients could assume that they have carpal tunnel syndrome (which is pain in the wrist and hands). If you suffer with unresolved neck pain or if you experience any pain in arm or hands the first thing we do is refer our patient for a MRI of the region so we can understand what is going on. Our office has a excellent relationship with a local MRI facility so if you do not have a MRI we can usually see a patient and have patients seen same day. A dermatome is a region of skin supplied by nerve fibers originating from a single spinal nerve root. Compression of the nerve roots affects sensation in the corresponding dermatome. For the past 10 years our office has used Non surgical spinal decompression for patients suffering with herniated and bulging discs. Spinal decompression is extremely safe with no side effects. 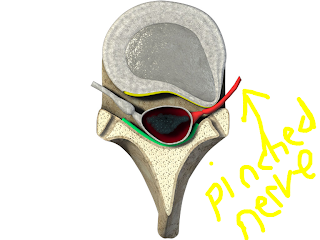 Pressure within a disc can be reversed, drawing in fluid as well as the herniated disc material. This removes pressure from nerve roots and relieves pain. I wanted to explain some of the common causes of Neck pain and how Non-surgical spinal decompression can help. a herniated disc (also referred to as a protruding or extruded disc) is a condition where a portion of the gel-like center of the disc has migrated through the layers of the annulus fibrosis. This can cause mechanical pressure on neighboring structures and trigger chemical reactions resulting in pain and inflammation. These changes will often irritate the nerves, producing numbness or tingling in the arms or hands. Degenerative disc disease is a state of dehydration and deterioration marked by the gradual erosion of the disc's ability to distribute and resist mechanical loads. As discs deteriorate, they become more susceptible to injury from physical stress. Degenerative disc disease may also play a contributing role in conditions such as disc bulges, disc herniations,and stenosis. Who are the best candidates for DRX 9000C treatments? Patients that may benefit most from the DRX9000C are those diagnosed with herniated discs,bulging discs and degenerative disc disease. What may I experience during the course of treatment? Some patients may experience light side effects with this type of therapy. Mild muscular soreness during or after treatment may occur. the sensation would be similar to what a person might experience at the onset of a new exercise regimen. Most patient find the therapy quite comfortable and relaxing. During an average 30-45 minute treatment, most patients experience a gentle stretch in the cervical spine and tend to fall asleep. Adjunctive therapies to non-surgical spinal decompression typically include electrical stimulation and cold therapy. Cold laser therapy is another tool that we use in our office to help with patients that suffer with neck pain. All too often patients diagnosed with cervical disc herniations and arm pain resort to invasive medical treatments like cervical epidurals, and neck surgery. Surgery should be your last resort after you have exhausted all non-surgical options first. Common causes include disc bulging or herniation, degenerative disc disease, spinal stenosis, osteoarthritis, and facet syndrome. Symptoms are pain, numbness, tingling and muscle weakness in the region of the shoulder, arms,hands or fingers. If you are suffering with these conditions a X-ray and a MRI can help to rule out serious injury and help determine the most appropriate course of treatment. Non-surgical Cervical spinal decompression works on the same principal as Spinal decompression for the low back. Pressure within a damaged disc can be reversed, drawing in fluid as well as the herniated disc material. This removes pressure from nerve roots and relieves pain. 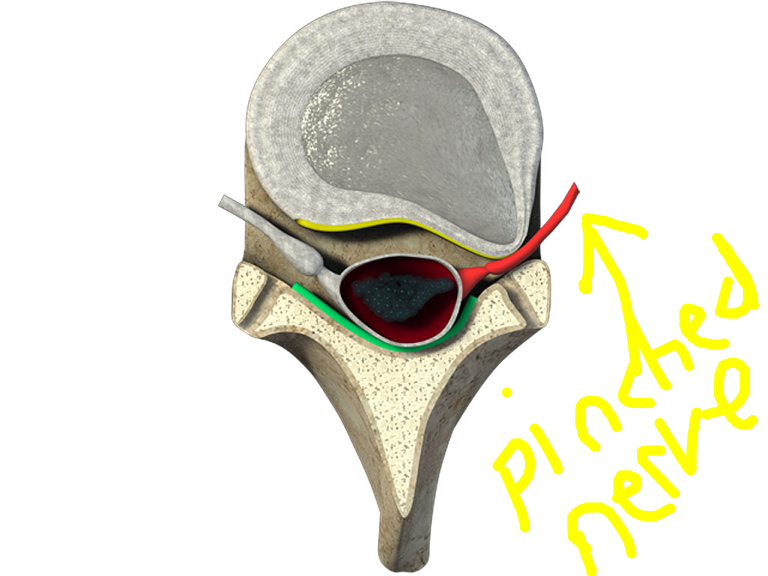 High intradiscal pressure causes discs to bulge out and press painfully on nerve roots. They also make for a compressed, anaerobic (little oxygen) environment unsuitable for healing. Non- surgical spinal decompression (NSSD) produces negative pressures within the discs, which experts believe create a vacuum effect that draws in nutrients and fluids to promote the repair of injured discs and surrounding tissues. This Vacuum has also been shown to aid in the retraction of escaped cushioning gel from herniated discs. Herniated disc diagnosis- Now what? If you have been suffering with back pain or nerve related arm or leg pain chances are that you have been told by your doctor to get a MRI of your Lumbar or Cervical spine. Why was the MRI ordered and what will the MRI tell you about your condition. The MRI is short for a Magnetic Resonance Imaging- It is the gold standard for documenting soft tissue injuries. Most of the time the source is from nerve irritation due to a Bulging or Herniated disc. Most of the time just because you have been diagnosed with a Herniated or Bulging disc doesn't mean you need a surgery,so relax there are effective non-surgical treatment. If you have a MRI report or an disc and you are interested in understanding the best non-surgical treatment options call us (212) 645-8151 to learn more about our NYC back pain and herniated disc treatment center. Most of the time when you go to a orthopedist or spine surgeon with a herniated or bulging disc the treatment involves 6 weeks of physical therapy and after that usually a epidural or or recommendations for a surgical consult. We have found that a combined approach using non-surgical spinal decompression, gentle Chiropractic adjustments and core-strengthing Physical therapy not only alleviate symptoms but succesfully decrease the degree of the actual disc herniation and post MRI clearly demonstrate reduced or even complete reduction in nerve pressure. We are offering a complimentary consult and MRI review for our non-surgical, non-drug patented procedure. We have been helping those who suffer in NYC with herniated disc and Sciatica utilizing non-surgical spinal decompression. Our patented methods helped hundreds avoid unnecessary surgery and avoid potentially dangerous invasive procedures like spinal epidurals. and the N and R at prince street. Dr. Steven Shoshany has been helping those that suffer with bulging and herniated discs, Sciatica and spinal stenosis without surgery or invasive potentially dangerous spine injections. Spinal decompression is a safe and effective procedure that helps reduce intra-discal pressure and reduces pressure on pinched nerves that cause pain like SCIATICA. If you or a loved one has pain we are offering a no-charge consult and MRI review to determine if you are a candidate for our procedure. Call (212) 645-8151 or visit my website to learn more. Spinal decompression when used in conjunction with Physical therapy can provide a permanent solution for for Back pain and Herniated disc problems.